The Blacksmith Lapwing or Blacksmith Plover (Vanellus armatus) is named for its repeated metallic 'tink, tink, tink' alarm call - which sounds similar to a blacksmith's hammer striking metal. In Africa, this species is also commonly referred to as "Bontkiewiet." It is distributed throughout southern and eastern Africa - where it occurs in the Savanna grasslands, wetlands, riverine forests and moist grasslands. 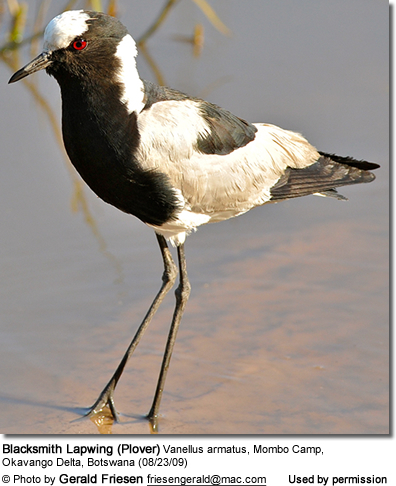 The Blacksmith Lapwing is common in Kenya through central Tanzania to southern and southwestern Africa, along rivers and lakes. In South Africa they are most numerous in the mesic grassland region, to a lesser extent in higher-rainfall grasslands. They are also quite common in the western Cape region of South Africa, where they were absent until the 1930s. Depending on environmental conditions, they are sedentary, nomadic or migratory. For example, in dry years they may move from arid regions to areas with more rainfall. It is usually sedentary when breeding. 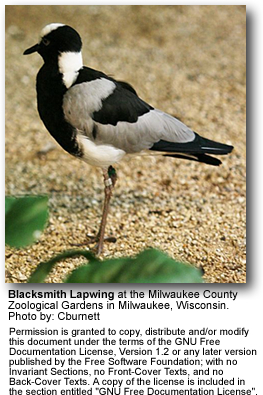 The Blacksmith Lapwing is at home in wetlands of all sizes, in riverine forests and close to lakes, dams and streams. In fact, even very small damp areas caused by a spilling water trough attracts them. They avoid mountains of any type. They typically occur singly or in pairs. 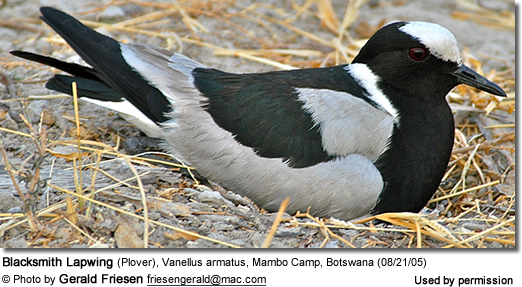 The Blacksmith Lapwing averages 31 cm in height, and weighs around 170 g. Females are usually larger; but other than that, males and females look alike. Its head is white with a black beak. Its eyes are red. Their plumage is boldly patterned in black, grey and white. The Blacksmith Lapwing is usually monogamous -- being loyal to one partner for the rest of its life, or until the mate dies, at which time it will pursue others. However, some polygyny has been recorded, but those occur rarely -- possibly because of lack of breeding success with his first mate. They breed throughout the year; although their peak breeding season occurs in July through October. They are territorial solitary nester. The nest is usually situated near water and hidden under a bush to protect the eggs and young from predators, such as Pied crows, gulls, coots, birds of prey, such as African harrier-hawks, or jackals. The nest usually is a simple scrape in the ground, usually lined with vegetation, stones and mud flakes. The average clutch size consists of 1 to 4 yellow eggs. Both parents incubate the eggs for about 26 to 33 days; typically in shifts of 20 to 80 minutes. The young leave the nest within hours of hatching but remain close to their parents. They fledge when they are about 40 days old and usually self-sufficient a month later. They feed on aquatic and terrestrial invertebrates, such as fish, crabs, shrimps, mollusks, worms, crustaceans and insects, including ants, butterflies, bees, wasps and locusts. They typically forage on the ground, using their specially adapted beaks to hunt; but may catch insects in flight. 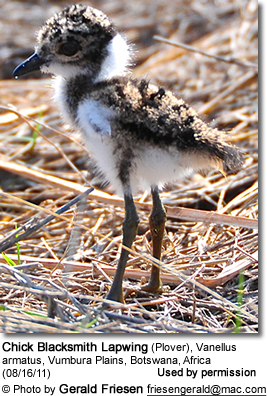 One case was recorded of one Kittlitz's plover chick being preyed upon by the Blacksmith Lapwings. They usually feed early and late in the day. While foraging for food, they stand still while intently scanning for prey. Once they spotted one, they will dash forward to recover it from the surface of the ground or water. Sometimes it is observed trembling its foot in shallow water to attract prey to the surface. It also searches for insect larvae in dung. The Blacksmith Plover has a very distinctive call, which resembles the sound of someone hammering a piece of metal - hence its name.